It turns out that this semester is a busy one, leaving me with no time to persue game development (thus far). In the meantime, I might as well document some of my web development. Students and Faculty are allowed access and can be granted administration to channels for upload of videos. Channels are delegated to schools, departments, student groups, major events, among other things. Only through owning or being a contributor to a channel can you upload video. 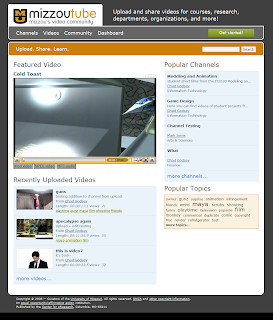 Anyone can register an account to subscribe to channels. A subscription lets you keep up to date with a channel so you know when new videos are uploaded, new events are scheduled and the like.